Roger Bacon (c. 1214 – 1294), was one of the most famous Franciscan friars of his time. He was an English philosopher who called for the reform of theological study, the study of foreign languages, and the integration of scientific study to the normal university curriculum. He placed considerable emphasis on empiricism, and has been presented as one of the earliest advocates of the modern scientific method in the West; though later studies have emphasized his reliance on occult and alchemical traditions. He was intimately acquainted with Aristotelian logic and philosophy, mathematics, and optics, much of it via the Arab world. Thus he served as a precursor for the reconciliation of science and religion through his call for academic development and reform of the Church in the study of scripture and science. Bacon is thought to have been born near Ilchester in Somerset, though he has also been claimed by Bisley in Gloucestershire. His date of birth is equally uncertain. The only source is his statement in the Opus Tertium (1267) stating, "forty years have passed since I first learned the alphabet." The 1214 birth date assumes he was not being literal, and meant 40 years had passed since he matriculated at Oxford at the age of 13. If he had been literal, his birth date was more likely around 1220. Bacon's family appears to have been well off, but, during the stormy reign of Henry III, their property was despoiled and several members of the family were driven into exile. Bacon studied and later became a master at the University of Oxford, lecturing on Aristotle. He crossed over to France in 1241 to teach at the University of Paris, then the center of intellectual life in Europe, where the teaching of Aristotle had, up until that time, been forbidden; Aristotle was only available via Islamic commentators. As an Oxford Master, Bacon was a natural choice for the post. He returned to Oxford in 1247 and studied intensively for many years, forgoing much of social and academic life, ordering expensive books (which had to be hand-copied at the time) and instruments. He later became a Franciscan friar probably in 1253, after ten years of study that had left him physically and mentally exhausted. The two great orders, the Franciscans and Dominicanss, were not long-established, and had begun to take the lead in theological discussion. Alexander of Hales led the Franciscans, while Albertus Magnus and Thomas Aquinas led the rival order. Bacon's abilities were soon recognized, and he enjoyed the friendship of such eminent men as Adam de Marisco and Robert Grosseteste, and the bishop of Lincoln. In the course of his teaching and research, he performed and described various experiments. The scientific training Bacon had received showed him the defects in existing academic debate. Aristotle was known only through poor translations, as none of the professors would learn Greek. The same was true of scripture. Physical science was not carried out by experiment in the Aristotelian way, but by arguments based on tradition. Bacon withdrew from the scholastic routine and devoted himself to languages and experimental research. The only teacher whom he respected was Petrus de Maharncuria Picardus, or "of Picardie" (probably the mathematician, Petrus Peregrinus of Picardie), who is perhaps the author of a manuscript treatise, De Magnete, contained in the Bibliotheque Imperiale at Paris. In the Opus Minus and Opus Tertium, he pours forth a violent tirade against Alexander of Hales, and another professor, who, he says, acquired his learning by teaching others, and adopted a dogmatic tone, which caused him to be received at Paris with applause as the equal of Aristotle, Avicenna, or Averroes. Bacon was always an outspoken man who stated what he believed to be true and attacked those with whom he disagreed, which repeatedly caused him great trouble. In 1256 a new head of the scientific branch of the Franciscan order in England was appointed: Richard of Cornwall, with whom Bacon had strongly disagreed in the past. Before long, Bacon was transferred to a monastery in France, where for about ten years he could communicate with his intellectual peers only through writing. Bacon wrote to the Cardinal Guy le Gros de Foulques, who became interested in his ideas and asked him to produce a comprehensive treatise. Bacon, being constrained by a rule of the Franciscan order against publishing works out of the order without special permission, initially hesitated. The cardinal later became Pope Clement IV and urged Bacon to ignore the prohibition and write the book in secret. 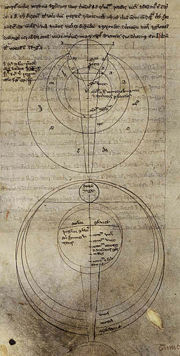 Bacon complied and sent his work, the Opus Majus, a treatise on the sciences (grammar, logic, mathematics, physics, and philosophy), to the pope in 1267. It was followed in the same year by the Opus Minus (also known as Opus Secundum), a summary of the main thoughts from the first work. In 1268 he sent a third work, the Opus Tertium to the pope, who died the same year, apparently before even seeing the Opus Majus, although it is known that the work reached Rome. Some claim that Bacon fell out of favor, and was later imprisoned by the Franciscan order in 1278 in Ancona for his dissemination of Arab alchemy which roused accusations of witchcraft, and his protests against the ignorance and immorality of the clergy. He supposedly stayed imprisoned for over ten years, until intercession of English noblemen secured his release. About this episode, the historian of science David C. Lindberg, quoted by James Hannam, says that "his imprisonment, if it occurred at all probably resulted with his sympathies for the radical 'poverty' wing of the Franciscans (a wholly theological matter) rather than from any scientific novelties which he may have proposed." Bacon died without important followers, was quickly forgotten, and remained so for a long time. In his writings, Bacon calls for a reform of theological study. He emphasizes that less emphasis should be placed on minor philosophical distinctions as in scholasticism, but instead the Bible itself should return to the center of attention and theologians should thoroughly study the languages in which their original sources were composed. He was fluent in several languages and lamented the corruption of the holy texts and the works of the Greek philosophers by numerous mistranslations and misinterpretations. Furthermore, he urged all theologians to study all sciences closely, and to add them to the normal university curriculum. He possessed one of the most commanding intellects of his age, or perhaps of any, and, notwithstanding all the disadvantages and discouragements to which he was subjected, made many discoveries, and came near to many others. He rejected the blind following of prior authorities, both in theological and scientific study. His Opus Majus contains treatments of mathematics and optics, alchemy and the manufacture of gunpowder, the positions and sizes of the celestial bodies, and anticipates later inventions such as microscopes, telescopes, spectacles, flying machines and steam ships. Bacon studied astrology and believed that the celestial bodies had an influence on the fate and mind of humans. He also wrote a criticism of the Julian calendar, which was then still in use. He first recognized the visible spectrum in a glass of water, centuries before Sir Isaac Newton discovered that prisms could disassemble and reassemble white light. Roger Bacon is considered by some to be the author of the Voynich Manuscript, because of his studies in the fields of alchemy, astrology, and languages. Bacon is also the ascribed author of the alchemical manual Speculum Alchemiae, which was translated into English as The Mirror of Alchimy in 1597. He was an enthusiastic proponent and practitioner of the experimental method of acquiring knowledge about the world. He planned to publish a comprehensive encyclopedia, but only fragments ever appeared. Bacon, R. 1267. Opus maius. Edited by J. H. Bridges, The 'Opus Maius' of Roger Bacon. Oxford, 1879-90, 3 vols., reprinted 1964; Part III, De signis (On Signs), ed. K.M. Fredborg, L. Nielsen and J. Pinborg, 'An Unedited Part of Roger Bacon's "Opus Maius: De Signis",' Traditio 34: 75-136, 1978. Easton, S. 1952. 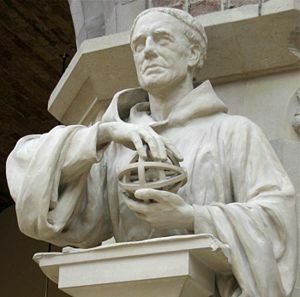 Roger Bacon and His Search for a Universal Science. Oxford University Press. Pinborg, J. 1981. "Roger Baon on Signs: A Newly Recovered Part of the Opus Maius." Miscellanea Mediaevalis 13: 403-12. This page was last modified on 16 July 2015, at 15:06.